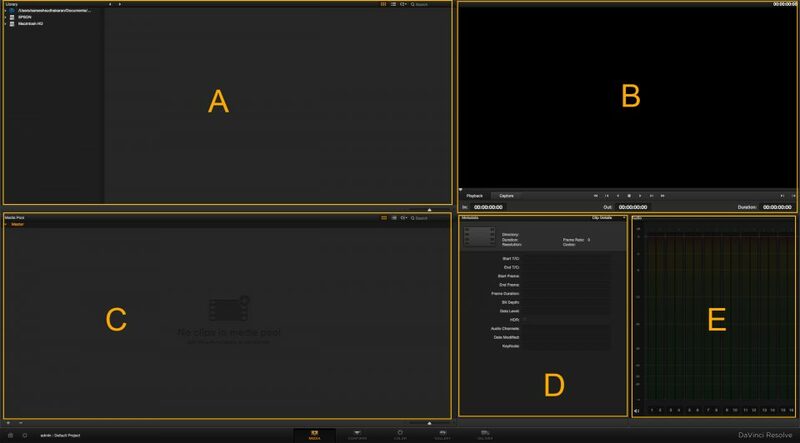 In Part One we looked at how to set up and get started with Blackmagic Design DaVinci Resolve. 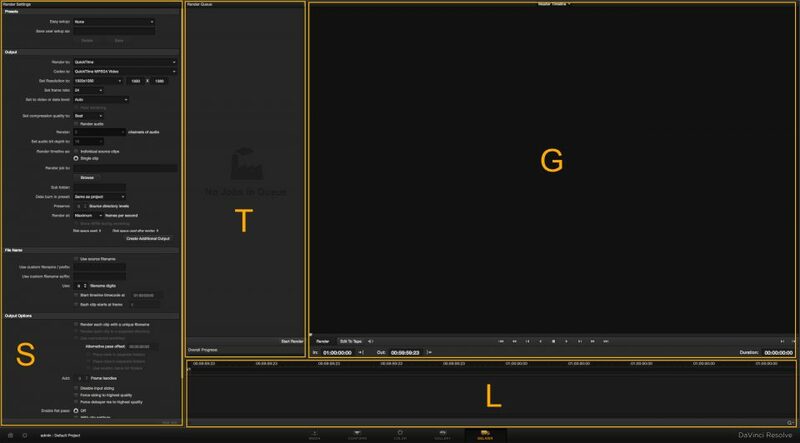 In this part we’ll look at the DaVinci Resolve user interface (GUI), and how to understand and organize the workspace. Media – this is where you import, ingest and log media. Conform – this is where you import EDLs, XMLs or AAFs of projects/timelines from other software. Color – Guess what this does. Gallery – this is where you organize and work with still images. Deliver – this is used for exporting and rendering. Let’s look at each stage one by one. The Library works like the Finder or Windows Explorer, and is fairly simple to use. Unsupported files do not show. The Playback and Capture panel shows the selected clip for immediate review. 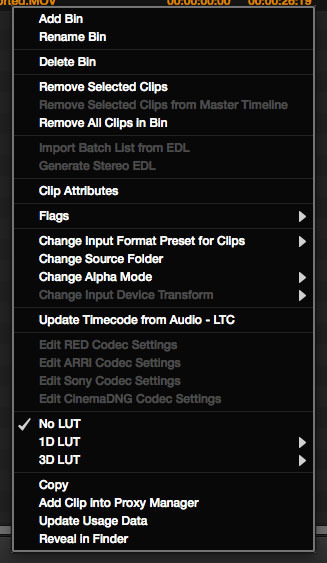 You can also log clips here before you import them. One odd thing I noticed was that the logging icons (In and Out point icons) are the same as the step forward and step backward icons. Thankfully they are to the far right so you won’t be clicking the wrong button often. Change presets or how footage is interpreted. Transcode footage to create intermediaries or proxies. Edit RAW codec settings from various cameras. What seems like a simple import pane has now become a powerful ingest and logging tool. It is laudable how Resolve hides its complexities and power until you are ready to use them. We’ll go into more detail on the import and conform workflow in Part Three. The Metadata panel displays the metadata in each clip. You can select which type of metadata to view from the top corner of this panel. The Audio panel shows how many channels each clip has, and the levels while you play back the clip. You can mute and un-mute audio with a simple click at the bottom left of the panel. Direct import of EDL/XML/AAF timelines from other software. The above, plus the import of media unrelated to the above. The basic idea is: You import your timelines from other software like NLEs, etc., and then arrange them in the order you want to work. You can correct problems with clips upon import, or make modifications to suit your current project requirements. This entire process is generally called conforming, and now you know where the name for this page came from. J – Stills Gallery – you can use this space to ‘dock’ your waveform, vectorscopes, etc. You work with each section on your timeline one by one – color correcting, matching, etc. You can use the gallery view for reference, etc. The Node view gives you a top-level overview of how the effects are stacked or layered, and you can turn them on or off individually. 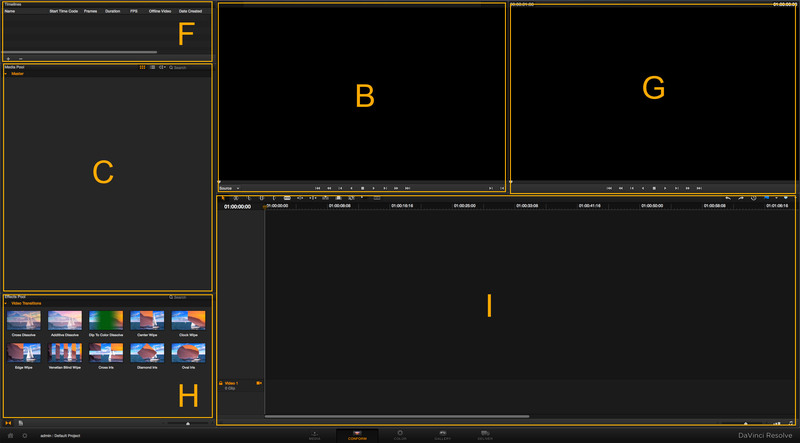 When you add masks (Power Windows in Resolve) and animate them, you’ll be using the Keyframe panel. The DaVinci Resolve manual is an excellent place to start reading and learning about its color capabilities. O – View Stills and Looks from other projects or databases available on your system. P – Displays the contents of what you’ve selected in the Stills panel. Q – Project Memories – presets applied to stills that you can use later. R – Project stills – Organization of stills into Albums – these are stills used in the current project. The Project Memories and Stills panels are available in the Color page under the title ‘J’. These offer a more expanded view, though, and are not exactly the same thing. You can use reference stills and memories to help you grade your projects. After all, Resolve is a tool for video, and still images take a back seat. You can queue renders, like any other professional application. You can also quickly study the timeline that you’re rendering out via the Compressed timeline and playback panels. Go through sections A to T again. You’ll see that the basic workflow pattern is simple and linear. There are very few GUI design elements that interfere with this workflow. The only thing you need to do is ‘get a hang of it’. 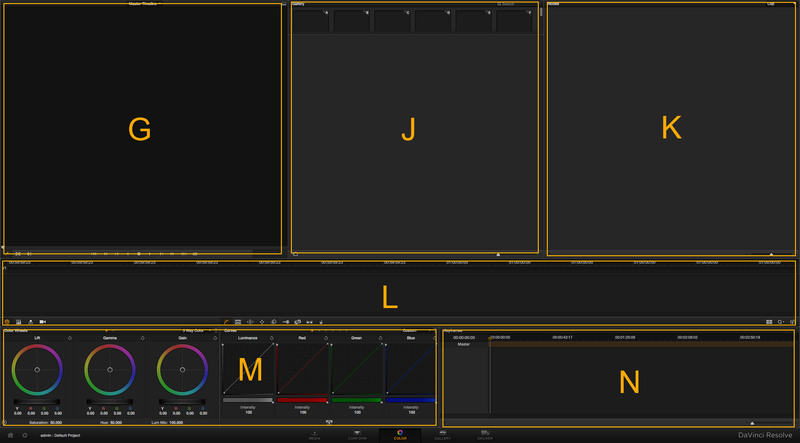 To be honest I can’t see how Blackmagic Design can make the interface any more simpler or intuitive. 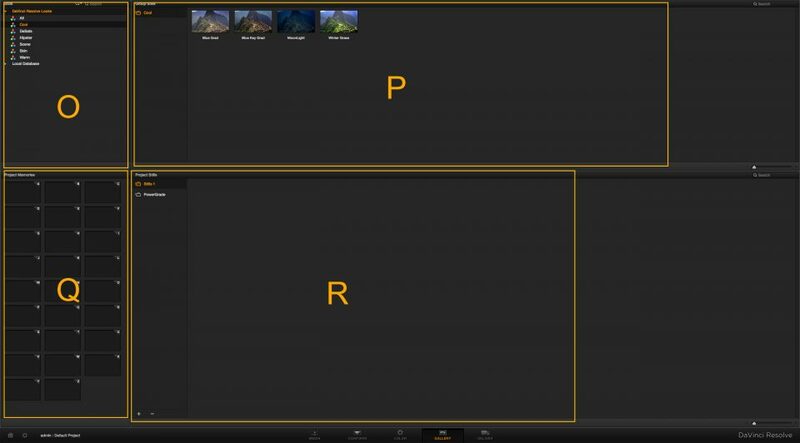 In Part Three we’ll look closely at how DaVinci Resolve imports and conforms footage and timelines.